Our range of products include laser comb for hair fall treatment. 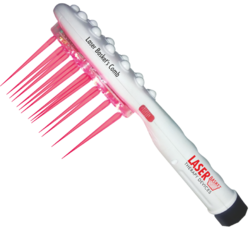 DR CURE AND CARE is the manufacturer of the LASER COMB. This laser comb provide relaxation through head massage and care your hair and scalp health. Laser diode will stimulate deep into the scalp skin. May result increases the activity of cells though hair fall contol will happen and regrowth phase will take place. This technology known as LLLT ( Low Level Laser Therapy). Light in weight will enchace the use of this compact and modern product. This you can bring with you anywhere to use. Both man and women can use it. Looking for Hair Fall ?